The annual roundup of bison at Fort Niobrara National Wildlife Refuge (NWR) will take place September 25-27, 2017. According to Project Leader Steve Hicks, “bison are handled during a fall roundup to keep the herd within the ecological carrying capacity of the refuge while conserving genetic diversity of the U.S. Fish and Wildlife Service bison population.” Sections of walkway above the refuge corrals have designated safe zones for public access, enabling visitors the opportunity to watch bison and photograph roundup action up close! During roundup week, small groups of bison will be cut from the main herd of ~400 animals located in an adjoining pasture and pushed down the runway into the corrals. Once in the corrals, bison are processed through the hub one at a time where the animal’s microchip is read, body condition recorded, and a portion of the herd is sorted off for additional handling. 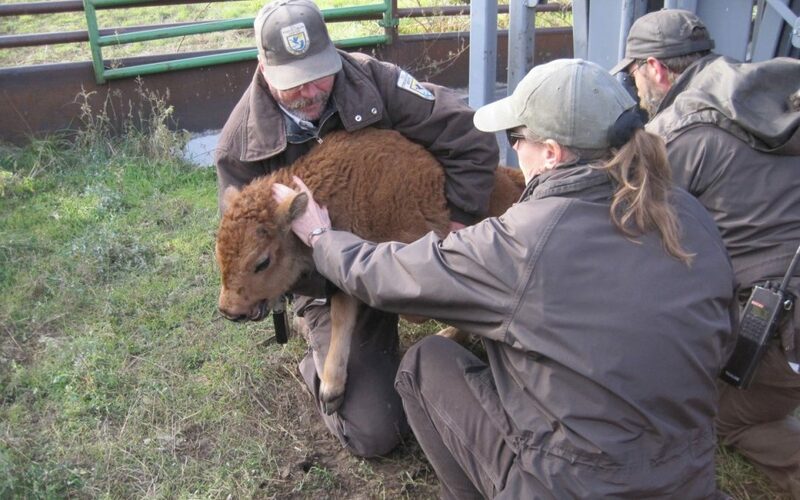 Calves will have a microchip implanted at the base of the ear for individual identification and blood and tail hair samples collected for genetic analysis. Approximately 50 bison will have samples collected for ongoing herd health monitoring. To keep the bison herd in balance with refuge grasslands while retaining as much genetic diversity as possible, about 60 bison with common genetics will be removed from the Fort Niobrara herd this year. In early October, 75% percent of the surplus animals will be sold through a competitive, sealed bid process and 25% will be donated to Tribal entities. Fort Niobrara NWR is located four miles east of Valentine on Highway 12 and the corrals are located just east of the office/visitor center. To find out what is taking place each day or to receive information for purchasing bison through the sealed bid process, please call the refuge at (402)376-3789. Sealed bids must be received at the Fort Niobrara NWR office by 3:00 p.m. C.D.T. on October 4, 2017.